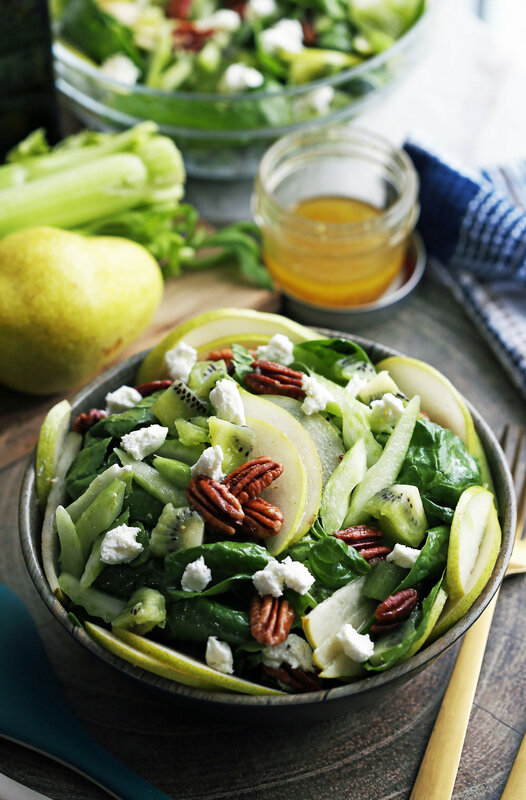 A blend of sweet and savoury ingredients with a variety of textures, this winter green salad recipe features delicious fresh spinach, sweet pears, and kiwis. Ready in ten minutes! Hello! Is anyone else super tired these days? Maybe it’s all the fantastic, but not-so-good-for-you holiday food or maybe it’s the cooler weather. Perhaps it’s the never-ending list of stuff that we need to do before the year ends. I can’t believe it’s almost December! Ahhh! Anyway, this healthy green salad is perfect this time of year. Delicious green vegetables and fruits, a little creamy cheese (because I love cheese), and nuts tossed in a homemade vinaigrette that’s ready in around 10 minutes!? Yes please! 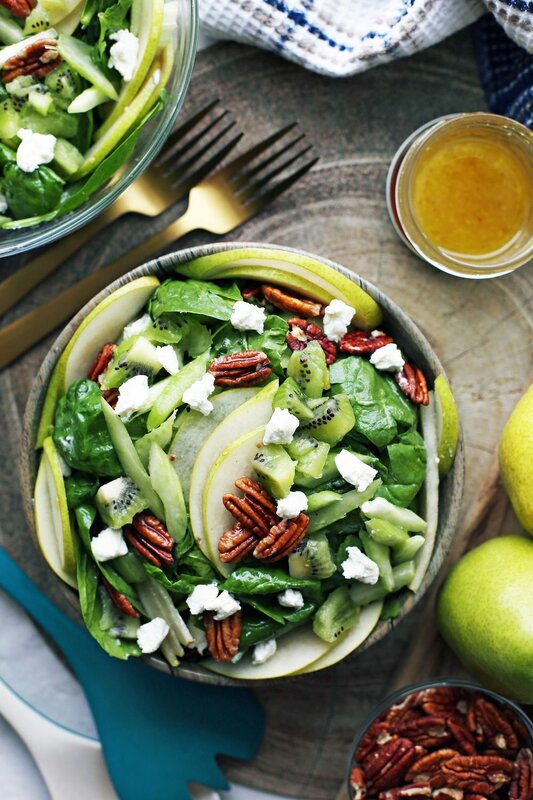 I hope you like this recipe for Winter Green Salad with Apple Cider Honey Vinaigrette. 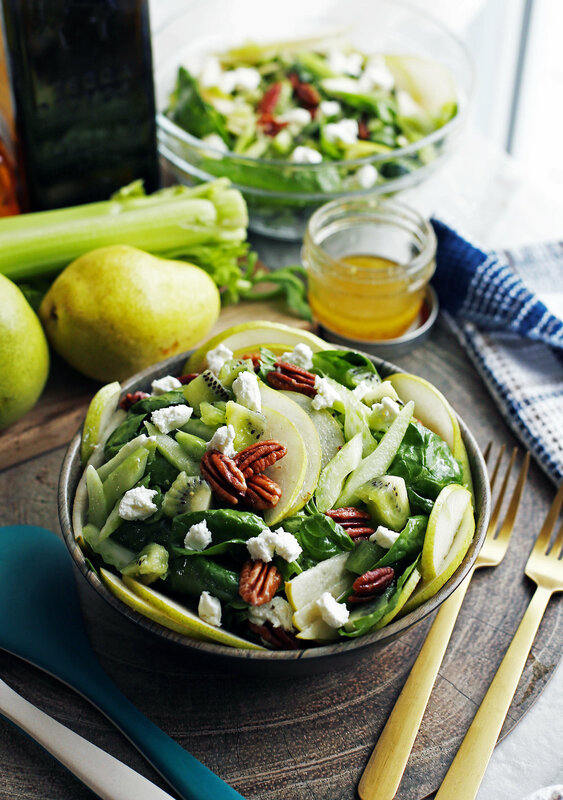 The base of this green salad is a generous amount of baby spinach. One of my go-to staple ingredients that’s available year-round. Not only do I use this vegetable in salads, I also add it to pastas, smoothies, and soups. Why? Baby spinach has a mild flavour (great to pair with sweet and salty ingredients), tender leaves (easy to eat raw), and it’s healthy for you too. For example, it’s a good source vitamin A, vitamin K, magnesium, and it’s full of antioxidants too. When choosing spinach, look for leaves that dark green and crisp in appearance. Avoid yellowing, limp, and/or slimy leaves. Then I like to add in celery for that refreshing crunch and mild sweet vegetable taste. For easy eating, I prefer slicing the celery rib into thinly sliced pieces, but you can slice it according to how large or small you like your celery. Did you know that celery is fat-free and made up of 95 percent water by weight? Pick celery that’s crisp, bright pale green with a tightly packed stalk and fresh, undamaged leaves. Now to the green fruit! First up, pears. I used a Bartlett (sometimes called a Williams) pear in this recipe. It’s has the signature “pear” flavour and scent and ripe ones are sweet and juicy. How can you tell if a Bartlett pear is ripe? The skin changes colour as it ripens in room temperature. Completely green skin is crunchy and tart, yellow-green skinned pears are mildly sweet and moist, and really ripe pears are yellow-green with sweeter notes and tender texture. Other pears that are delicious raw are Anjous, Bosc, and Asian pears and would make lovely substitutes. Kiwifruit (often just called kiwi aka Chinese gooseberry) is an edible berry with fuzzy brown skin and green juicy flesh with tiny black edible seeds. It also has an unique tasty sweet-tart flavour. It’s nutritious too; it’s rich in vitamin C, vitamin K, and a good source of fiber and copper. Choose kiwis that are plump, fragrant, and give when applied with gentle pressure. Don’t choose ones that are too soft, bruised, or have damp spots. I have a habit of adding nuts and cheese to my salads too. In this case, pecans and goat cheese. Pecans are satisfyingly crunchy and taste rich, buttery, nutty and a little maple in flavour. You can substitute pecans with walnuts if you prefer. To finish, goat cheese is tangy with a soft, creamy texture. A great contrast to the sweet ingredients in this salad. Then there's the easy vinaigrette. It’s a simple apple cider vinegar (use organic and unfiltered if available) and honey-sweetened olive oil-based dressing. A little bit of Dijon mustard and sea salt gives the dressing a well-balanced flavour that’s goes wonderfully with the salad. I like to place all the ingredient in a small mason jar, seal it with a lid, and shake it well until all the ingredients are mixed together. If you don’t have one handy, just place the ingredients in a bowl and use a small whisk or fork until it emulsifies together. I’ve got more fall and winter green salads! Check out these ones. 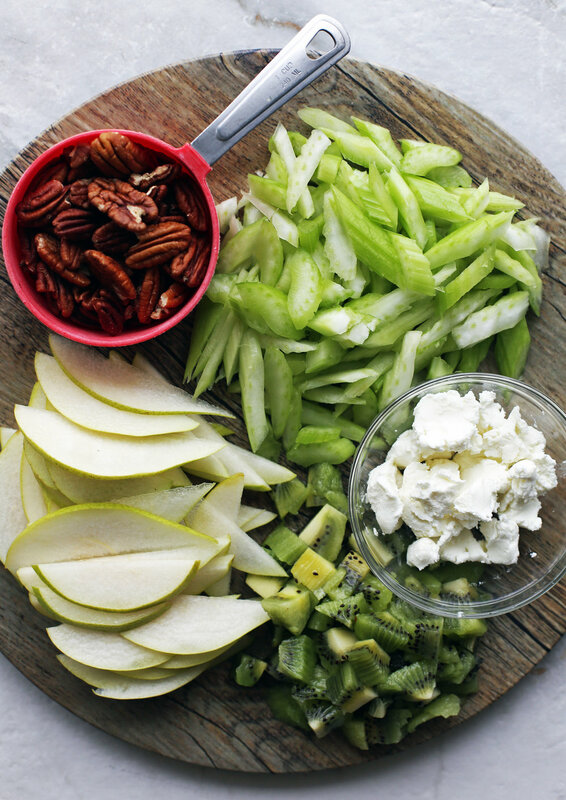 Full of delicious savoury and sweet ingredients: A great assortment of green vegetables and fruits, cheese, and nuts. Nourishing and filling: This good-for-you salad makes for a fantastic seasonal light meal or side dish. 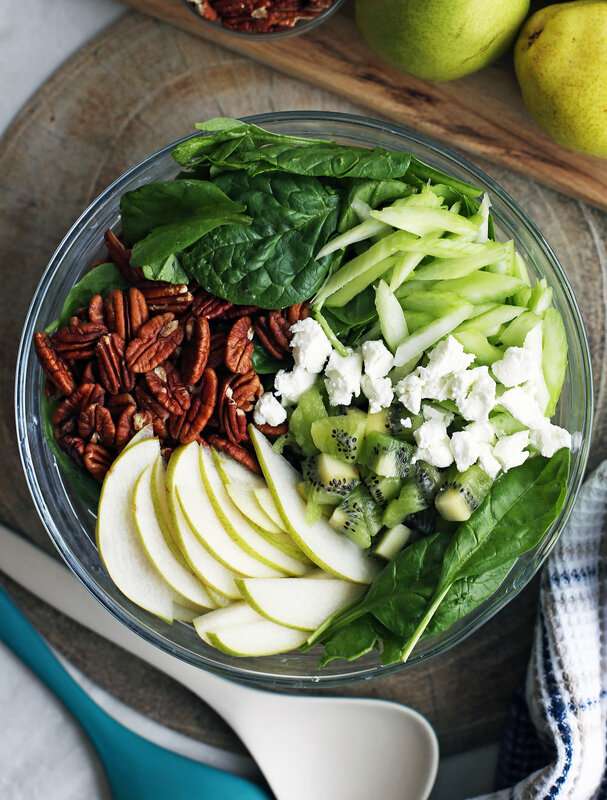 Texture-rich: It’s has tender spinach, kiwi, and pears, crunchy celery and walnuts, and creamy goat cheese. Quick and easy: It’s simple to assemble together in only about 10 minutes. Easily customizable: Add more or less ingredients of your choice if you want. For example, if you like it a little more sweet, add more pears and kiwi or adjust the dressing by adding more honey. A delicious vegetarian and gluten-free dish. I hope you try this recipe! If you do, please leave me a rating and comment down below or tag me on any of my social media. I’m @yay_for_food on Instagram. I’d love a picture! In a small bowl (or mason jar), whisk (or seal with lid and shake) together the vinaigrette ingredients until well combined. Taste and adjust the dressing to your preference. In a large bowl, combine the salad ingredients, then drizzle the desired amount of vinaigrette on top. Toss to combine. Best served immediately. I used a Bartlett (Williams) pear in this recipe. Other pears that are delicious raw are Anjous, Bosc, and Asian pears and would make great substitutes. If you are planning to have leftovers, keep the salad separate from the vinaigrette and cover both in the refrigerator for up to 2 days. Re-whisk the vinaigrette and pour over salad just before serving. Store remaining dressing in an airtight container in the refrigerator for up to one week. Nutritional information represents one serving with a total of four servings.